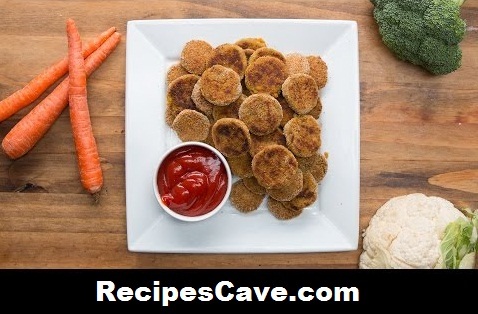 Veggie Nuggets Recipe is for vegetarian people. If you are non veg then you don't need to taste cause you will not like it but if you are vegetarian then this recipe will give you yummy taste. 1. In a food processor, blend carrots, cauliflower, broccoli, garlic, egg, onion powder, salt, and pepper until combined. 2. Add 1¼ cup of bread crumbs and blend just until incorporated. 4. Place the remaining ½ cup of bread crumbs in a bowl and cover each nugget with the bread crumbs. 5. Either pan fry with a small drizzle of oil over medium-high heat until both sides are golden brown, about 10 minutes. Or you can bake them on a piece of parchment paper at 400˚F/200˚C for 25 minutes, flipping after the first 15 minutes. your Veggie Nuggets Recipe is ready to taste.